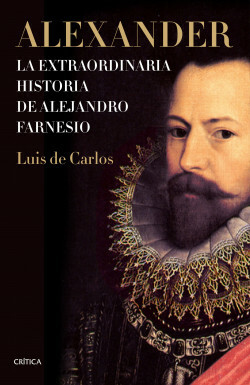 This work is the first biography of Alexander Farnese (Rome, 1545 - Arras, France, 1592), Duke of Parma and military officer in the service of Spain. He was descended from a pope and an emperor. As a teenager he went to the court of Spain, where he was educated; in 1565 he married Princess Maria of Portugal. As a soldier in the service of the Spanish Crown, he excelled in the defense of Spanish possessions in the Netherlands. In 1571 he took part in the battle of Lepanto. Six years later, he launched the campaign in Flanders. Alexander Farnese defeated the rebels at Gembloux and recovered the southern Catholic provinces. In 1578 he was appointed governor of the Netherlands. In 1586, when his father died, he inherited the duchies of Parma, Plasencia and Guastalla, but ceded his administration to his son Ranuccio to continue in Flanders. A year later he successfully faced an English force led by the Duke of Leicester. In 1592, his army liberated Rouen. Shortly afterwards he returned to Flanders, where he died as a result of injuries sustained in the battle of Caudebec, waged against the French armies.